One of the missions of the Will Rogers Institute is to educate the general public on topics of health and fitness. In 2008, The Will Rogers Institute partnered with the Boys and Girls Clubs of America to honor one club each year for 5 years with a $5,000 cash prize. 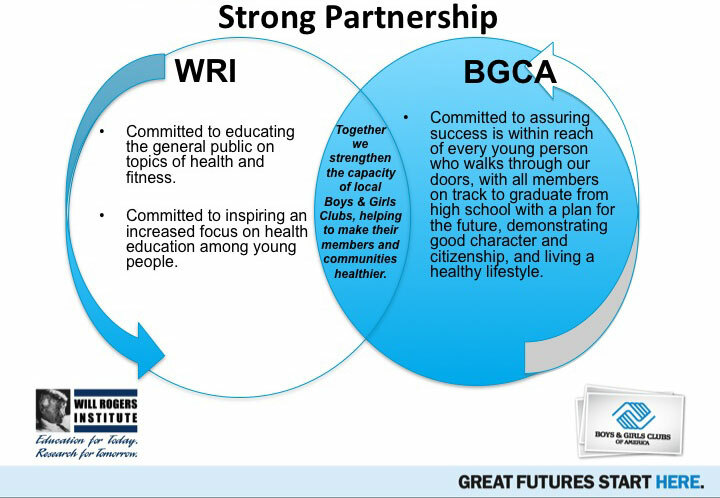 The award was given to the club that demonstrated exemplary methods of promoting healthy and active lifestyles In addition to the cash prize, WRI also donated $15,000 to Boys and Girls Club of America national fund each year to provide health-related materials to clubs across the country. Offered internships for its Triple Play interns to help provide fun, high-quality and impactful wellness activities to 5,000 youths. Staff participated with kids and chief staff person lost 50 pound. Created a fitness challenge program for all four Clubs in Benton County. A total of 2,600 children participated in the program with 86% meeting exercise intensity levels recommended by Arkansas Department of Education. Changed its vending machines to offer healthier beverages, and also provides more low-fat or baked snacks. With the support of the Food Bank of Eastern Michigan, the Club launched a new “Summer Weekend Backpack” food program in which 100 kids receive a bag of food each week to take home. Created a “healthy habits” program which empowers youth to eat right by teaching kids about calories, vitamins and minerals, portion sizes and the power of food choices. The program equips young people with skills to adopt healthier habits encouraging healthy and active behaviors that will last a lifetime. Developed a nutrition program that provides over 200,000 free healthy meals to children and their families in Ada County each year. In addition, they offer classes on the importance of nutrition.